This March break I went to Breakout Con for the first time. A teaching colleague (Dennis Ku) told me about Breakout Con earlier this year and I was intrigued. 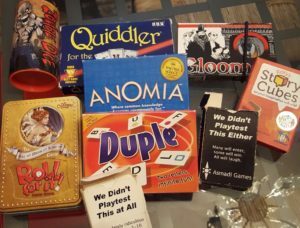 Breakout con is a gaming convention; three days of boardgaming, play testing, and tabletop rpgs (roleplaying games). This year it was held at the Sheraton on Queen Street (Toronto). I attended this convention expecting to play my stress away, and end my March Break with a bang. What I did not expect was to reflect on this experience as a teacher and use this it to inform my teaching beliefs and practices. It was obvious to anyone who attended that inclusivity was valued by the organizers of the event. There were many small, intentional, moves that set the tone. For example, at the front entrance of the con, by the registration table, there were pages of pronoun stickers. Introverted and uncomfortable asking people to join your game? Not a problem, there were signs you could use to signal to potential players that you (or your group) were looking for more players, and if you needed help with learning a game. feel uncomfortable. A player simply touches the card to indicate to the game master (GM) their discomfort, and the content of the game is changed. The player does not have to explain their reasons for discomfort. That being said, one GM shared, when asked, that a player choose to reveal that they had a fear of spiders when they touched the ‘X’, thus leading the GM changed the spiders in the story to scorpions. Easy peasy. The ‘X-card’ was only one of the many mandatory safety tools the convention had put in place. These aspects of creating an inclusive environment for all, made me wonder about what elements I can add to my next classroom experience (I am currently in a central teaching role) to ensure my students feel safe and included. One of the main features of the convention was a large ballroom area dedicated to boardgaming, where people could play games they may have never played before, either with friends or new acquaintances. When I first arrived on Friday morning, this was my first stop. 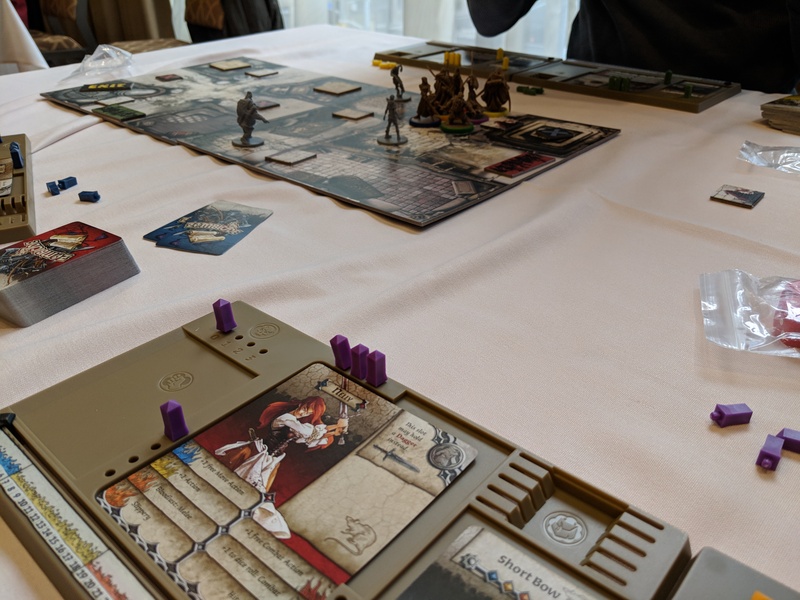 I almost immediately notices a ‘looking for more players’ sign and joined two people beginning a game of Zombicide: Black Plague. 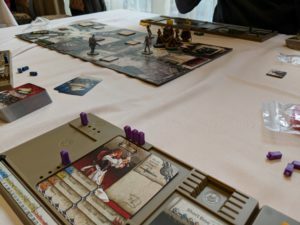 It had been a long time since I had played this game, and neither of the other players had played this version of Zombicide, so reading the rules was important to us. What became clear to us pretty quickly was that we had all interpreted the text slightly differently. As a result we had to reread certain paragraphs more closely, and cross reference them to the images included in the instructions. It reminded me of the guided reading lesson I had taught in the past about attending to text, the importance of rereading, and using text features to help with comprehension. There is a lot of pressure in being a GM of a game. There is a lot of prep done before the game to learn the important narrative points of the module being played, and anticipate where players will want to go, and what they might do. The GM’s job is to facilitate the storytelling and ensure that all the players have a good time building the story. The challenge, much like in teaching, is being able to assess when a challenge is approaching the abilities of the group, so that it is neither too easy, nor too hard I experienced this from the ‘student’ side of the equation in a couple of the RPG games I played*. Most of the games were run by GM’s who had run the same sessions in the past, but I did have one GM who was not expecting to run the session they had. As a result the game was made it a bit easy, and rules were not followed closely, especially when it looked as though a character might suffer. This became frustrating to me as I felt we were not being challenged enough, even though I liked the GM as a person,* I found myself wishing the game would end sooner. When have my students felt as though they were not challenged in my classroom? In my first year of teaching I learned that it was important to set norms and rules for my class (co-create). I also learned that when I did not follow up on my norms or reinforce the rules, behaviour would be impacted.In another game norms for participation were not set, and as a result there were times where multiple players spoke over each other, rather than listening, and taking turns. It is worth noting that the majority of the players in this game were under the age of 13, and did not appear to have a lot of RPG experience. Yet it was a nice reminder to me about not assuming everyone implicitly knowing the norms when entering play. In the end, the 3 days of gaming was a good stress relief and a great learning experience. I will definitely attend again next year. *Note: all my game masters were lovely, and I would play with them again, but there is always room for descriptive feedback.